Brendon is a single dad, entrepreneur, a glutenfree-er and one of our calendar men. His company, Gluten Free for Men, makes pretty tasty BBQ sauce that I can use on just about anything, so I definitely recommend you try it. He’s also created an “online man cave” to satisfy all of your manly GF needs. “Do you know someone struggling with gluten-free living? 1. Why are you Gluten-Free? I am not officially diagnosed with celiac, but I was having digestive issues for about two years; including far too many emergency trips to the bathroom. I always suspected I had a problem with things I was eating and blamed it on coffee. Like most men, I was hesitant to see a doctor – which is stupid. A friend of mine explained that he was having the same issues and recommended cutting out gluten. So I did, and immediately saw results. I went to the doctor a few months after going gluten-free, he said I’d have to eat gluten again to take a blood test; that an endoscopy would be the best way to know for sure. But he said if my symptoms completely reversed, then I should remain gluten-free whether I came up positive or negative. There is no way my gut could handle that. So, since my insurance didn’t cover the test, I elected to save the cash and not be tested; though I plan to. I think living gluten-free, as long as you’re making healthy choices, can be good for anyone no matter what their celiac status. The best part about being gluten-free is that it has forced me to read labels and check ingredients. I used to just check for gluten, but now I look for so much more. I’ve cut out most processed foods, and my shopping cart is full of real food now. That’s why I get mad when the media portrays the gluten-free diet as ‘dangerous’ for those who don’t have celiac. You never hear those same people say you should consult your doctor before eating McDonald’s. I would tell anyone who thinks they have a problem with gluten to do the opposite of what I did. Go talk to your doctor now, and request to get tested. Even if you don’t think you have a problem with gluten, I’d challenge you to avoid it, focus on real foods for a month and see how you feel. Going gluten-free seemed scary at first, but my health problems immediately improved, and I started gravitating toward healthier foods. I can still grill steak, smoke ribs, drink good beer, and enjoy my favorite guilty pleasures. It’s not easy, but I wish more men would forget their insecurities, address their health issues, and get tested. 2. Tell me a little about your company, Gluten Free for Men? 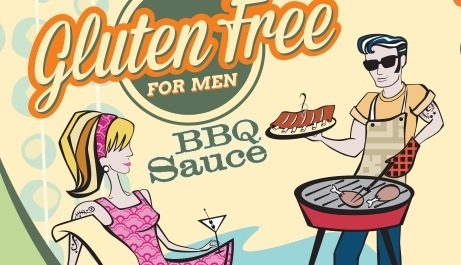 Gluten-Free for Men is an online place where guys can learn how to live gluten-free without giving up the things they enjoy. If you want to learn about gluten-free alcohol, food, health, nutrition, and the latest news in the community; then GFFM is your way of doing it all in one place. Consider this your online gluten-free man-cave. Stay as long as you like, and check back regularly for updates. where is his recipe please?